Whatsapp is one of the best ways to be in touch with one another. All the time it works significantly without a single hiccup. However, after updating the iPhone to iOS 12, the bundle of problems arrived, and one of them was Whatsapp not working in iOS 12. After reading the forums I have shortlisted the most common problems that users are facing such as Whatsapp notifications problem, Unable to connect WhatsApp, WhatsApp frozen after updating to iOS 12, WhatsApp won’t send pictures, WhatsApp won’t send video, WhatsApp won’t connect video call, WhatsApp won’t connect the call and much more. One of the primary reasons behind this is a weak internet connection. Besides this, if your number is blocked by opposition then it is not possible to send or receive messages, it might be possible that you haven’t completed initial verification process and the last one is checking the WhatsApp number. You should check for WhatsApp update on your iPhone’s App Store. Generally, this thing happens, and I have read this like, Whatsapp not responding or Whatsapp not working after iOS 12 update. If this error is embarrassing you don’t worry within a few minutes it will automatically get solved by their technical team. Whatsapp keeps crashing after updating iPhone to iOS 12 is the most common issue among iPhone users. Rather than crashing some of them have reported that Whatsapp won’t send messages, Whatsapp paused or down, Whatsapp won’t open and much more. This entire situation is very annoying but not much complicated that we cannot solve them. Have a look. The prior fix to troubleshoot any app is to force close the app. Most of the time it works so let’s give a try. Step 1: Double click the home button and swipe up the window of that app. As I mentioned before a good internet connection is necessary for smooth working of WhatsApp.If you haveWi-Fi, then disconnect the iPhone and again connect to the network, or you can reset the Wi-Fi router. But if you are using carrier’s data plan, then the only thing you can do is reset network settings. Step 2: Tap on “Reset” and there click on “Reset Network Settings”. After a few minutes open the WhatsApp and check the issue is gone or not. In most of the cases, updating the app is helpful, and some of the relevant issues get fixed because of updating the app. Go to App Store and update the app. 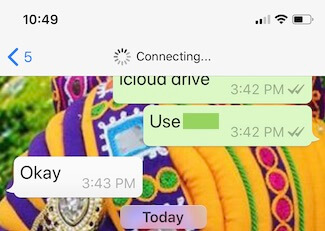 This can help if your Whatsapp got crashed, Whatsapp won’t open, or Whatsapp got frozen. You need to delete the app from iPhone and again install it from App Store. Step 1: Tap and hold on the Whatsapp icon. Step 2: when you see (x) on the top of the icon tap on it and delete it. Restart the iPhone and again download the app. This trick also useful whenever iOS 12 Whatsapp notifications not working. This action will result in complete data loss so before performing Reset you much take backup. Step 2: Now, scroll and open “Reset”. Step 3: There tap on “Erase all Contents and Settings”. By entering your passcode, the process will be completed and your iPhone will be restored to its factory settings. Do you have tips or issues for Whatsapp iOS 12? Then feel free and reply to us in the comments.